The choice of cars and trucks on the Canadian market has never been so wide and diversified, and to help consumers make the right purchase decision, The Car Guide’s team of journalists publishes its yearly Best Buys in every vehicle category. 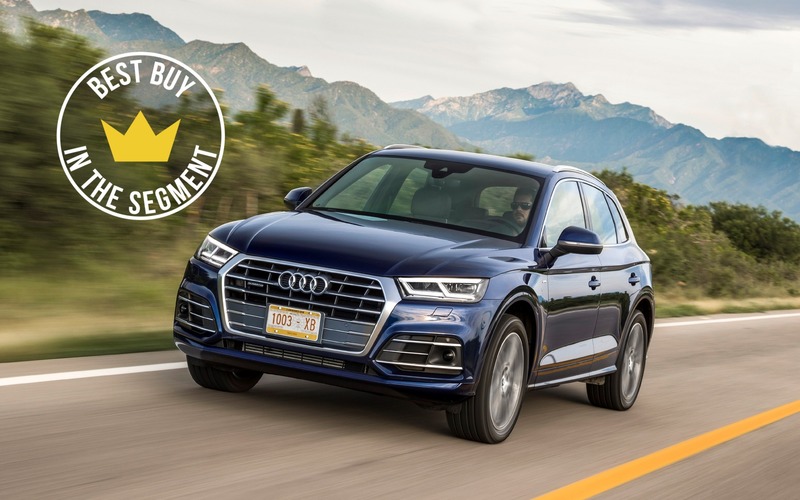 In the luxury compact SUV segment, the Best Buy title for 2019 was handed to the Audi Q5. The Car Guide’s journalists love its high level of refinement, the smoothness and reasonable fuel economy of its 248-horsepower engine, the capability of its all-wheel drive system and its excellent road manners. And as always, its exquisitely trimmed cockpit is a tradition Audi has gotten us used to for many years now. Also: 2019 Acura RDX: Some Personality at Last! The SQ5 variant possess all these qualities, but in a sportier package that’s resolutely fun to drive. It’s equipped with a turbocharged V6 engine that develops 349 horsepower, a full-time quattro all-wheel drivetrain and, as an option, an air suspension that cleverly blends comfort and dynamic handling. The 2019 Audi Q5 retails from $45,300 before freight and delivery charges. In second place in the luxury compact SUV segment, we find the Acura RDX (MSRP from $43,990). Freshly redesigned, the RDX relies on a much sportier character and the latest technologies to stand out. Its 272-horsepower, turbocharged 2.0-litre four-cylinder engine and SH-AWD system provide brilliant performance, while the SUV’s cockpit marries luxury, comfort and versatility. In third, it’s the Porsche Macan (MSRP from $54,100) that got our journalists’ attention. It amazes by its driving dynamics on par with the brand’s sports cars, in addition to being rigorously assembled and boasting a relatively good reputation for reliability. For 2019, the Macan is available with a 252-horsepower, turbocharged 2.0-litre four, a 360-horsepower turbo V6 and a 400-horsepower twin-turbo V6—all connected to an all-wheel drivetrain. First Drives 2019 Acura RDX: Some Personality at Last!